It keeps me up at night. This question. I lie there and try to put my finger on it. 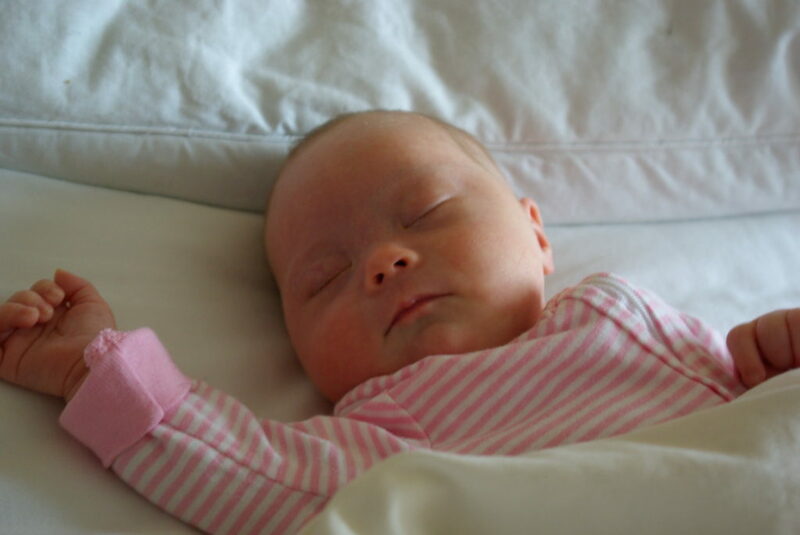 I try to remember what it was like before Frankie was “just Frankie.” When “My baby has Down syndrome” was still my first thought when I opened my eyes every morning. I look at Frankie’s face, her body, her movement, her features. I scrutinize her. Can people tell? I think. Are they scared of her? Why would they be? Is it her nose? Cute as a button. Her eyes? So gorgeous. The way she scoots? Adorable and innovative. The way she pulls to stand? So strong. The way she smiles hugely as she manages to wiggle away from her therapist? So smart and so cheeky! 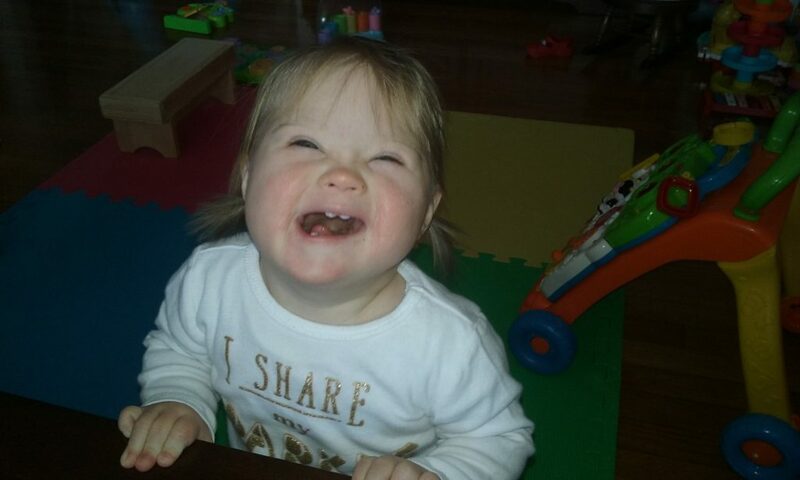 I look at all these features that people associate with Down syndrome and think Nothing scary here. “I can’t do this,” I said when we got her diagnosis a week after she was born. “You can. We will,” my mother replied. “You have to do this,” she said. I hope you don’t think I’m the terrible person I sounded like. I was shocked. I was uneducated. I was scared. Now I see a pretty, determined little girl making her way from baby towards toddler. Maybe a little slower than others, but fiercely nonetheless. But then I saw limits, dead ends, unteachability. Exclusion. Slowness. I saw only failure. I was ignorant and that made me afraid. The truth is, I shudder to think what I might’ve done if I had had a prenatal diagnosis and therefore had known Frankie was going to be born with Down syndrome. If I was presented with tons of “she will nevers” and had a grim future laid out for us by some doctor who couldn’t possibly know HER. Some figures estimate that 90% of pre-natal diagnoses end in termination. Yes, I was scared when she was born, but she began educating me the moment I held her. I was lucky I had the most beautiful distraction from my thoughts of utter doom. But it’s easy to love a little baby, right? What about teenagers and adults with Down syndrome? Are they scarier? In the beginning, as I was still processing things, I remember saying that I was sure Frankie would be an adorable child, I was more worried about what she would be like as an adult. We are a society always striving for bigger, faster, stronger, smarter and when you’re faced with a diagnosis where you think none of that is ever going to be achievable, you start to panic. What if my child needs help – possibly a lot of help – to walk, to talk, in school, at work, in life? What am I supposed to do? Will we ever be happy again? What will people think? I think I was mostly afraid of that stereotype of an adult with Down syndrome, bagging groceries with garbled speech and a big smile. Let’s forget for a minute that that is not necessarily a reality for many, many people with DS. Let’s think instead – what exactly is wrong with that? What is wrong with a person who is doing an honest job and doing it well, doing their best with what they’ve got and doing it with a smile? If that person is happy and if that person is loved, what does it matter what anyone else thinks? I think a lot about how we got this way. How we came to a place where we’re afraid of people who are not at the top of their class, who are not prom queen, who don’t go on to earn a six figure salary with a higher degree from a prestigious university. People who live ordinary lives and do ordinary jobs. The reality is that very few people actually go on to do those grand things, but there’s something about knowing from the get-go that they’re not even possible that makes it all a game changer. But I’ll be completely honest – if I had read this when we first got Frankie’s diagnosis, I wouldn’t have been comforted. I was still unable to accept that my child might be less than the best. Less than successful. Or what I had defined as successful at that point. I was very much “that’s fine for you, but that’s not us.” I was scared that Frankie wouldn’t be smart or pretty or regarded in any way. That her life would be lived under the radar basically unrecognized by anyone but her immediate family. If you’re that mom right now, let me assure that your baby’s future is as bright as anyone else’s. That he or she has options. There are people with Down syndrome blazing trails! Madeline Stuart: Beautiful Model! Tim Harris: Successful Businessman! Jamie Brewer: Talented Actress! Megan Bomgaars: Savvy Entrepreneur! Chris Burke: Respected Advocate! Karen Gaffney: Intelligent speaker, inspiring athlete and all around star! People who are very much ON the radar! There are protocols to help your family with everything from thyroid function to congenital heart defects to cognitive ability should you choose them. There is education from Early Intervention through to college programs for your child. 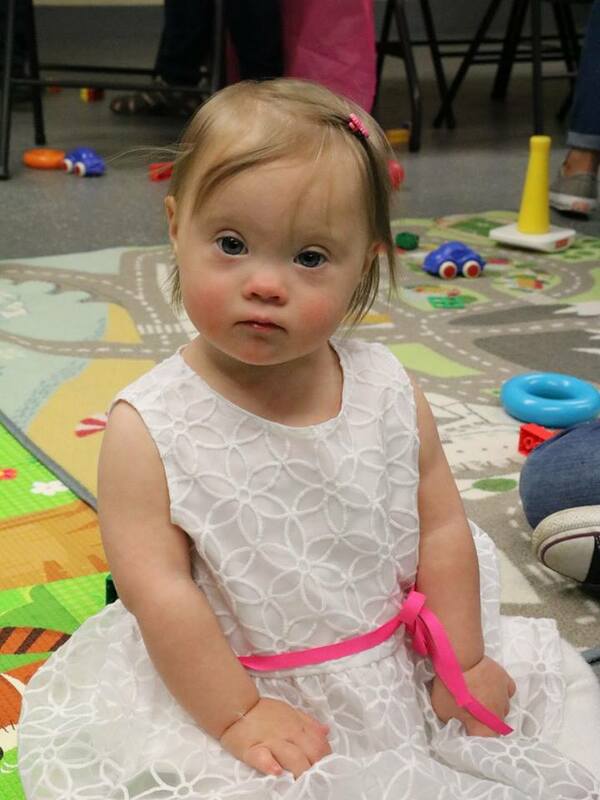 We are all learning as a community every day and it’s a great time to be a person with Down syndrome. Take it one day at a time, and let your child blossom. I promise they will. In the meantime, be comforted by what you already know: Our babies are not scary. They are not broken, or less than, or substandard. They can do nothing with anyone’s pity or prejudice or patronizing or fear. But they can do everything with our encouragement, our support and our love. My Most Perfect Moment: Happy Mother’s Day! Your words couldn’t have explained any better. My granddaughter, also birth diagnosis, has brought more joy and unity to our family than we could have ever hoped or prayed for. Thank you for sharing your story! And isn’t she just the luckiest girl to have chosen a mother like you? Omg!! This was me! I was so upset to learn my son had DS. Now at 4 months,I barely think about the DS and just see my son,the beautiful,adorable human being that he is. That article was the best I have read in a long time and so true . Loved reading this. Your daughter is beautiful! This is a good post! Thanks. I think the problem is our “postmodern” view of success and “perfection”. We are too materialistic and in the First World particularly everything is about money. This means that we miss the small, free joys of life which become very apparent to the parents of children with DS. By this I mean the joy of making step forwards in development, any step, the joy of laughter and pleasure in the ordinary things; nature, the waves splashing at the seashore, jumping and playing sharing fun activities. The child with DS has no guile, they don’t fit into the world of materialism and they smash that untruth with their simplicity and vision of the world as it really is. Beautifully written. Echoes the thoughts of many parents! Me included !!! Hi Farah. You don’t know me but I went to elementary school with your mom. I have been reading your blog from the beginning and your words sometimes move me to tears, both happy and sad. You have a beautiful little girl and I know she will thrive with all the love and care of your family. I look forward to watching Frankie grow. Fantastic article. Sums up exactly how I felt when my son was born and how now I am so glad I didn’t have prenatal testing. You would have to be an extremely strong minded person to overcome the negativity a prenatal diagnosis brings. Once you hold your beautiful baby in your arms the diagnosis is far less scary! Dear Farah,my daughter Ammalin also birth diagnosis,im proud to have her in my life n now she’s 10 month old n for me she is the most beautiful baby in the whole world like yours too,Frankie was so beautiful little girl….you know Farah when doctor told me about her i didnt suprised at all…tqsm Farah for sharing n your experience inspiring me. Well said! So many of my feeling 34 years ago when my son was born. So many more opportunities available now. The sky’s the limit. God bless you and your precious baby. I have deep, deep regret that I was scared during my pregnancy. I was miserable, depressed, scared, and my health and family suffered. The minute my daughter was born any fear turned into love and I never looked back. I also questioned why I was so scared. She is the best thing that has ever happened to our family. She is pure joy. Thank you for sharing. I felt that way too, 28 years ago. My beautiful daughter has taught so many people that Down syndrome does not define who she is or what she has accomplished. She is not famous or a spokesperson for people who have disabilities. She is a young woman who lives in an apartment who has a meaningful job at Lifetime Fitness. She loves listening to music, going to the theatre and doing word searches every day. She exercises and eats healthy. She is a Special Olympic athlete and a volunteer. She loves to travel and is a daily user of Facebook. She is just like many other young people I know. She is ordinary and extraordinary at the same time. Simply put though, she is amazing and an inspiration to many.